• How do we get to the marina and on board? Depending on your event, there are various ways. If you have a cruise planned, we will organize transportation from the airport or train station as part of your holiday. • Is there a service to pick up at the airport or train station? For other events we will be happy to organize pick up with a small added fee. all indications will be furnished at the time of booking. • At what time do we come aboard and disembark? Depending on your event, the times vary. For cruise events from outside Italy you come on board directly from your flight in. Otherwise embarking takes place from 12:00 on and disembarking after breakfast before 11:00. For regatta events each race has a schedule that will be published as more information becomes available in regard. • Is it possible to request modifications to the itinerary? 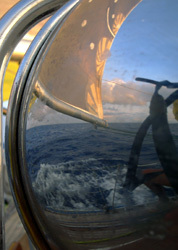 Once on board, modifications are possible with the Captain's consent and weather permitting. • Is it possible to plan time for tourism on land? Absolutely. We will be happy to suggest options. • Is it necessary that we navigate? It’s not obligatory. We can stay in the marina or at anchor wherever and for as long as you like.